The smart contact lens has a tiny sensor that can measure a user's glucose level, and alert them when it's low. Anyone who's ever played any first-person shooter will be familiar with the concept of a heads-up display, or HUD. In games, they usually measure your health, armor, and ammo. However, in real-life, people don't (usually) carry ammo and armor, and "health" is kind of a broad thing to measure. Something that can be monitored, though, is a diabetic's glucose level. Thus, Google have just announced its "smart" contact lens project - a contact lens with tiny sensors to monitor glucose levels, and alert the user when they are low. It's a HUD for diabetics. Google notes that tears are one of the best bodily fluids to check glucose levels with, but as it's kind of hard to cry on command, it's not really a practical way for most diabetics to use. 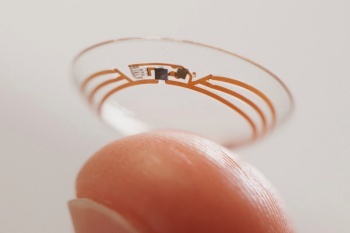 The Google Smart contact goes right to the source, sitting on the eye, using a miniaturized glucose sensor embedded between two layers on the lens, to take glucose readings from the same eye fluid tears are made of. According to Google, the sensor can take about one reading per second, and it is working on adding tiny LED lights to the lens to warn users when their glucose levels cross certain thresholds. I would like to imagine a big red "WARNING! Eat candy!" message would pop up when it got too low. Google says it is now working with the FDA to turn these prototypes into real products, and with several other partners for distribution deals. These partners, the company says, "will use our technology for a smart contact lens and develop apps that would make the measurements available to the wearer and their doctor." All that crazy stuff we used to dream about having in sci-fi movies is very slowly becoming a reality. I'm waiting for the day someone develops a facial recognition app for these lenses, so it can tell me people's names when I forget.